For all inquiries about these analyses, please contact Dr T. McGonigle. 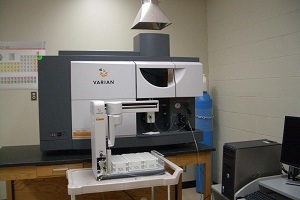 We use Spectrometer, 715-ES Radial ICP OES, Varian, Canada, with Automatic Sample Preparation System SPS-3 AutoSampler for this analysis. Samples are introduced in liquid form. Many elements (up to 70 in theory) can be determined simultaneously in a single sample analysis. Currently, such elements as Ca, K, Na, Mg, P, Mn, Zn, Fe, Cu, Mo and S have been determined in water, soil extracts, and digested samples, and Cd, Co, Ni, Sr, B, Y, Rb, Ni, Al, As, Ba, Cr, Pb, Se and other elements can be determined as well. In this plasma emission spectroscopy (OES), a sample solution is introduced into the core of inductively coupled argon plasma (ICP), which generates temperature of approximately 8000oC. At this temperature all elements become thermally excited and emit light which is collected by the spectrometer, converted to an elemental concentration by comparison with calibration standards. 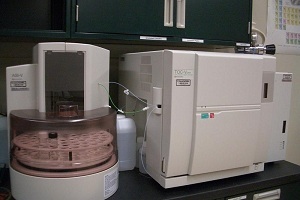 TOC System, Shimadzu TOC-Vcph, Mandel, Canada is used for this analysis and it measures amount of total carbon (TC), inorganic carbon (IC), total organic carbon (TOC), purgeable organic carbon (POC), and total water-borne nitrogen (TN) in water and in liquid form of various samples. TOC can be measured using the following 3 methods: TC-IC Method, recommended for samples that contain less IC than TOC; NPOC Method, recommended for samples that contain more IC (exceeding 5 ppm) than TOC; and POC+NPOC Method, for samples that contain volatile organic carbon compounds. Sample is introduced into the TC combustion tube, which is filled with an oxidation catalyst and heated to 680oC and burned, as a result, the TC components in the sample are converted to carbon dioxide. The carrier gas finally delivers the combustion products to the cell of a non-dispersive infrared (NDIR) gas analyzer, where the carbon dioxide is detected. We use Determinator System, TruSpec-CN Elemental, LECO Instruments, USA, which determines Carbon and Nitrogen content of a variety of materials, including foods, feeds, oilseeds, fertilizers, meats, soils, and plants. 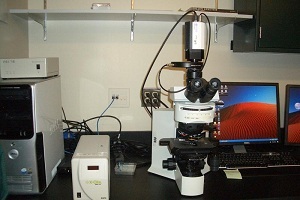 Sample is introduced in solid form; ground to 0.5 mm to 2 mm particle size is recommended. Sample is introduced and purged, flushed with oxygen for very rapid combustion in a hot furnace (950oC). 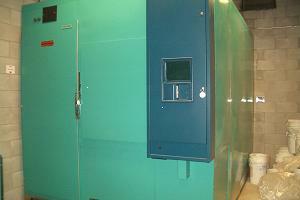 The combustion gases are collected in a vessel purged through the CO2 infrared detector and carbon is measured. After removing CO2 and water, thermal conductivity cell is used to determine the nitrogen content. Analyzer, Astoria2 with 311 AutoSampler, Astoria-Pacific International, USA can determine nitrite nitrogen, ammonia nitrogen, total kjeldahl nitrogen, nitrate+nitrite nitrogen, total phosphorus, ortho-phosphate, and chloride in drinking, surface and saline waters, domestic and industrial wastes, plants, and soils. Samples are introduced in liquid form. The system is based on Segmented Continuous Flow Theory. Samples are aspirated sequentially combined with chemistry specific reagents and diluents, dialyzed, heated or subjected to other specific conditions necessary for the desired chemical reaction to occur, which usually results in the development of a colored complex. 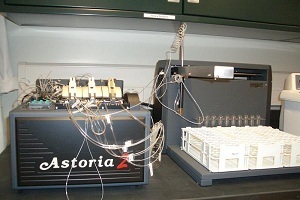 As the reagent stream passes through a flow-through cuvette, the detector takes absorbance measurements and converts them to electronic signals. 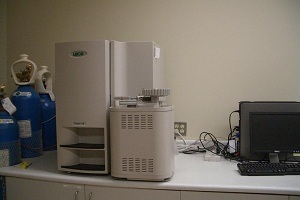 Determination of analyte concentrations is based on the comparison of peak height and known calibration standards. Microscope System, BX51 Microscope, EXFO X-Cite Light Source, OptiScan II Prior, Olympus Canada, QCapture Pro, Image-Pro Plus Version 6.0, Reflected Fluorescence System and Microscope System, MVX10 Microscope, EXFO X-Cite Light Source, NCL 150, Olympus Canada, Image-Pro Plus Version 6.0, Reflected Fluorescence System are used for this purpose. 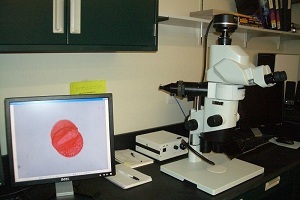 Pollen Analysis: Environmental samples such as plant, soil, leaf litter, fossil deposits, paleobotanical and archeological materials can be examined microscopically and using the image analysis software determined pollen and spores and identified by comparing with reference materials. 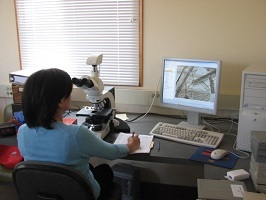 Microhistological Analysis: Plants, animal diets, stomach contents, and feces can be examined using the microhistological technique anddetermined for cell and tissue characteristics, botanical composition, and identifiedto genus or species by comparing with reference materials. 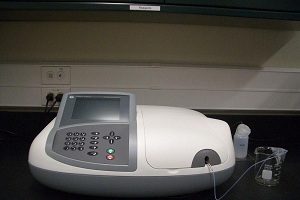 On this Spectrophotometer with Sipper, proteins, aminoacids, nucleic acids in biological materials can be quantified and purity checked by measuring absorbance, concentration, and % transmission (in wavelength range 190-890 nm). All plant trials and experiments can be conducted in our two ConvironTM PGV36, controlled environment walk-in growth chambers with CO2 (ambient to 2990 ppm), temperature (4 – 45oC) and light control (timed diurnal on/off and irradiance up to 1400 µmoles), with 3.3 m of growing area (2 m height). In addition, with the Imaging System, Arabidopis System of Regent Instruments, that consists of WinFOLIA for leaf analysis, WinSEEDLE for seeds and conifer needles analysis, and WinRHIZO for root measurement, botanical characteristics, number, area size, and color can be determined. Samples can be plants from the field, greenhouse, or garden, and be in fresh, dried, pressed and herbarium material forms. For all other basic laboratory measurements we have the recent models of scientific equipments some of which listed below, that produce reliable accurate and precise results.